Power is supplied to the MCB2100 board by an external 6 - 9 Volt DC power supply which must be capable of providing up to 150mA of current. 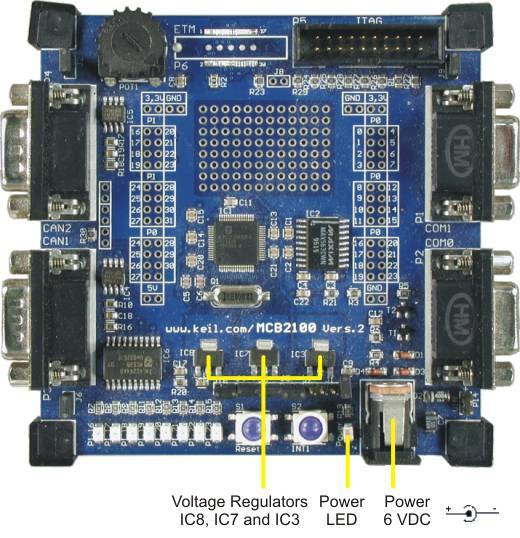 The voltage regulators IC8, IC7, and IC3 generate 5 Volts, 3.3 Volts, and 2.8 Volts DC. The Power LED indicates when 3.3 VDC power is present on the board. Caution: Using a power supply with the wrong polarity will damage the board. The connection uses a standard 5.5mm barrel plug with a 2.1mm inner diameter. The center conductor provides positive voltage.